How could I have left out Ernie Kovacs???????????? Being 68, but essentially having ceased watching television after July of 2002, some of these I am quite familar with and a few I have never seen. 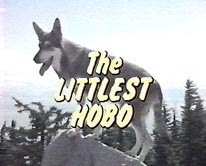 The littlest hobo *rules. * Completely wrecked my heart. What about Mal Sharpe's interview show, The Street People? Is this why I read the surrealists in high school? I'm glad to see you corrected the Galactica typo. Does this post not make any sense, or is it me? I vote for makes no sense. To whom did Kookie lend his comb in the end, anyway? When does Connie Stevens get her reappraisal, anyway. Oh God, this takes me back. SO funny! Of course, I was a complete failure at both. But it's amazing how the issue loses all meaning when you leave the USA. I think over here you'd be talking in terms of "conventional." But "conformist" is different: sinister, an ism, and more violent. Conform is something matter must be made to do, as opposed to a convention which one may simply observe, however haphazardly, or not. I thought Mad Men was a bit thin, just a soap dressed up, and unconvincing as to the period (though you'd need the corroboration of some old ladies, and they don't seem to watch that stuff. Disappointing. Moreish though. Why can't I just think Battlestar Galactica is awesome? 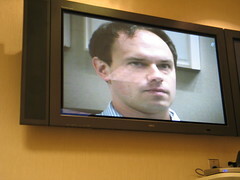 What's the difference between believing it is a great television show & fetishizing it? Who, precisely, thinks that liking this stuff makes them nonconformist?? Monks? And, Jordan, where's my copies of The Hat? Hm. Maybe it's awesomeness that's being fetishized. My Occam's razor isn't sharp enough to be sure, however. The Monks were a great band. Check 'em out. I always suspected you were a Cylon! i was born in 1970, i am a teevee tube baby, when i was growing up the telly ran alltha older shows, slow heat of the tube, that perfect vacuum tube, analog warmth. my narrow path came via an episode of Dragnet, my introduction to French poetry, i've tried & tried to find that episode again, but no luck, alltha Dragnets are titld like "the Big something...", my mythos title calls it "The Big Rimbaud Beatnik Birdkiller", the episode had this highschool kid discovering Rimbaud, Baudelaire et. al., transforming into a beatnik, at one point he squeezed the neck of a bird to kill it, i think he ended up killing his gym teacher! there was recitation of Rimbaud lines, it flipp'd my little lids. but mostly, it was the cartoons! Betty Boop in "ha! ha! ha!" "And from this dragnet of flames it allows stars to shoot."